Today we’re going to do a cheater’s version of Saturday storytelling time. I didn’t actually write a story this week, but I’ve thought about it a lot. Incessantly, so surely it’s only a matter of time before it pops out of my head fully formed. So this is a story I wrote a few years ago. In honor of Halloween, it’s a monster story! It’s a story for children (childrens’ book publishers form an orderly queue) about a boy and his monster. Here are some pictures I did for the story. The text is after the jump. And, as ever, we have a recipe, too! This is an autumnal galette. The crust has walnuts and black pepper, and the inside has roasted beets and roasted mushrooms, as well as butterbeans sautéed with chard. It’s all topped off with smoked gouda. Lots of warm, sweet, earthy, smoky flavors! “Go to your room!” Yelled Oswald’s mother. “You’re a monster.” Cried his sister, stomping her little foot. “FINE! I. Don’t. Care. 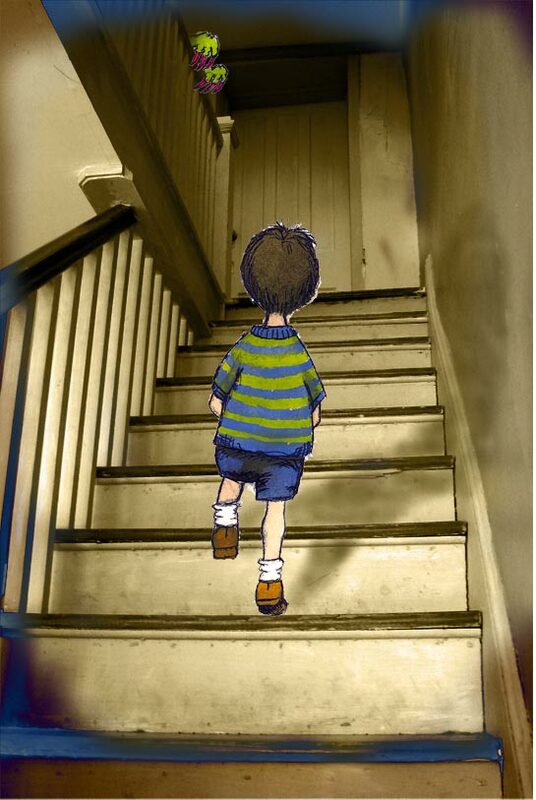 Maybe I’ll just live up there.” And Oswald clomped up the stairs as loudly as he could and slammed the door behind him. He threw himself down on his bed and cried a little. He rolled on his back and felt his hot tears cool as they puddled in his ears. “I’m a monster,” He said, sniffling. But the truth was that she missed him. And the truth was that he was bored. And lonely. He was sick of looking at his room. So he closed his eyes. “WOULD YOU GET OUT OF HERE! !” Yelled a loud buzzy voice close to his ear. And when he opened his eyes he saw the strangest thing that he had ever seen. “Who are you?” Oswald asked. The monster slumped beside Oswald on the bed, shooting him very cross looks. “I have a monster?” said Oswald, his mind reeling with the possibilities. “Of course you do. Everyone has a monster,” said the monster. “What do you do?” wondered Oswald. “That’s not very nice! !” cried Oswald. “No! I know! Very sneaky, I was, just like they taught us at monster school.” The monster sounded smug. “Monster school? There’s a monster school?” Oswald asked. “Of course not. Not A monster school. Many many. I went to the best, of course…” bragged the monster. “Can’t tell.” The monster snapped his beak shut decisively. They sat side-by-side on the bed and nobody spoke for a while. “Now what?” Oswald had never discovered he had a monster, before, and he wasn’t sure what came next. “How did you know about that?” Oswald interrupted. “I ate the last ones you left there.” The monster declared, very pleased with himself. “Of course,” boasted the monster. “Oho! Even better. Extra points for me.” The monster rubbed his scaly hands together. They ate all the candy and drank all the strawberry soda pop. “So why aren’t you trying to make me cry now?” Oswald asked. They ran and flew around the room. They jumped on the bed. They giggled and hollered. They heard a hand on the doorknob. “Oh my god, what is that?” yelled his mother. “He’s my…” began Oswald. But his mother didn’t wait for him to finish. “How did you do that?” Oswald asked admiringly. “Learned it at monster school.” The monster replied coolly. The monster made a sound that reminded Oswald that he was a monster. And he made a face to go with it. They spent a pleasant afternoon talking and playing checkers and mancala. Oswald suspected that the monster let him win a few times. “Of course not. I’m not working at the moment, am I? I think I know how to do my job.” But it seemed to Oswald that the monster looked a little scared, and glanced over his shoulder. Oswald had such a nice day that when his mother brought him dinner and asked if he’d come down and spend some time with his family, he forgot to yell at her for forgetting his milk. Many times in Oswald’s life he had worried that he might have a monster under his bed. He had imagined what it might do to him while he was sleeping. Well, that night he really did have a monster under his bed, and he found it very difficult to sleep. The monster crawled under his bed as soon as the lights went out, and from that moment he didn’t make a noise. But a thin curl of smoke rose past Oswald’s pillow. “Monster.” Oswald whispered over the side of his bed. “Not tonight.” Said the monster, sleepily. The next morning Oswald was as tired and cranky as could be, and the monster declared him in a perfect mood to begin monster school. “Okay, I’m ready! Teach me how to disappear!” Oswald had been thinking about this all night. Out of thin air, the monster produced a book. It looked very old; the cover was red and worn, and the pages were brown and crumbling, and were covered with strange spiky writing. Oswald caught tantalizing glimpses of many odd, vividly covered drawings. “Can I see?” Oswald asked, reaching for the book. “Certainly not. It’s very old and fragile. I’ll read to you the parts that you need to know. This is the Monster’s Primer. We will begin with basic types of monstering.” He opened the book and cleared his throat dramatically. “’One, to inflict awe-ful terrors of the nyghte, and cause dreadful sleeplessnesse.’ That’s when we keep you awake. Pretty basic that one… ‘Two, to cause nervousnesse in the cows and the horses, and to see that the hen will not laye egges’.. Don’t use that one too often nowadays, although I have spooked your dog once or twice.” The monster chuckled at the memory of this. “I don’t want to learn this boring stuff. I want to scare someone. I want to disappear.” Oswald pouted. By the end of the morning, Oswald didn’t want to go to monster school anymore. The monster had perched on the rail of his bed, reading from the monster primer, stopping only to quiz Oswald on the facts. He’d made Oswald repeat every classification of monster, from Agathodaemon to Zanki. And Oswald had learned highlights of monster history (The battle of the Hobgoblins and Brownies ad 872 to ad 874) and been tested on the dates. After they had cleared the bed of peanut butter and jelly crumbs, Oswald sat with a notebook on his knee, ready to learn about tricks. At exactly midnight, when milksilver moonlight threw patterns all over Oswald’s room, he and the monster set off down the hall. They used special monster tricks of complete silence, which they had practiced all afternoon. They even managed to walk over the dog without waking him, although Oswald had to think very monstrous thoughts to stop himself giggling with glee and nervousness. All was quiet in his sister Sally’s room. Her curtains were closed completely, but she insisted on having four nightlights, so it wasn’t hard to see. Sally had curly hair and tiny teeth, and she liked to call herself ‘the kid sister.’ At the moment she slept sprawled on her back with her short arms thrown up over her head, and she breathed with a soft whistle. Oswald used his newly-learned monster skills to open the closet door, and he chose her favorite shoe. He turned to show the monster. The monster wasn’t looking at him. The monster was looking at his sister, and Oswald thought he looked very silly. But the monster hadn’t moved. Oswald could swear the monster was almost smiling. He’d never smiled at Oswald. And he was…purring! But it was a loud rumbly grumbly sound, and Oswald felt sure it would wake his sister. “Shhhhh!” Oswald hissed. He couldn’t account for how cranky he felt. And apparently he wasn’t the only one, because, all of a sudden, as if out of nowhere…another monster appeared on the bed. “Get away from my girl!” it cried. 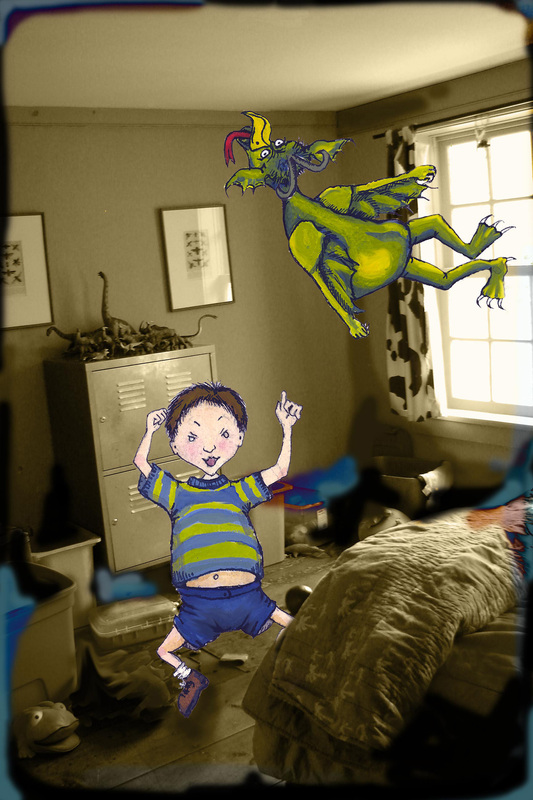 “Eek, a monster!” shrieked Oswald’s monster, and jumped into the very narrow space between Sally’s bed and the wall. Sally sat up and yawned and rubbed her eyes. Oswald dropped her shoe. He held his breath. What would she say about the monster on her bed? “Of course you are!” said Sally. Oswald’s monster rose from behind the bed, looking very angry. Oswald would have been scared of him, but Sally and her monster didn’t seem to mind. “You took CARE OF HER? That goes against all the rules!” Oswald’s monster yelled. “Well, at least I wasn’t teaching her secret monstrous secrets! !” Sally’s monster yelled back, in her raspy voice. “My monster is better than yours, Oswald.” Sally said, with a smile. “That’s the nicest thing anybody’s every said about me.” Said Oswald’s monster, and he sounded like he had something stuck in his throat. “That’s the nicest thing Oswald has ever said about anybody!” said Sally. By the time Oswald and his monster left Sally’s room, she was fast asleep, with one hand curled in her monster’s long silky hair. Her monster whuffled contented snuffling noises in her ear that made her laugh in her sleep. Oswald crawled into his bed, and his monster slipped under it. They lay in silence for a while. In a food processor combine the walnuts, salt, pepper, and flour and process briefly. Cut the butter into tiny chunks and add that too. Process until just combined and coarse and crumbly. Add enough ice water to bring it together into a workable dough (start with about 1/4 cup). Process to combine. Form into a ball, flatten, wrap in foil and chill for at least 1/2 hour. In a large skillet over medium heat, warm the olive oil. Add the shallots and garlic, stir and fry until they start to soften and brown. After a few minutes, add the herbs and pepper flakes. Stir and cook for a minute or two, and then add the beans, chard and a few tablespoons of water. Cook till the greens are wilted and soft but still bright green, 2 to 10 minutes, depending on the greens you use and how you like them. Add the balsamic and butter, and stir in the beets and mushrooms. Season well with salt and pepper. Lightly butter a smallish baking sheet. Roll out the dough to be bigger than your baking sheet by a few inches on all sides, and about 1/8th inch thick. 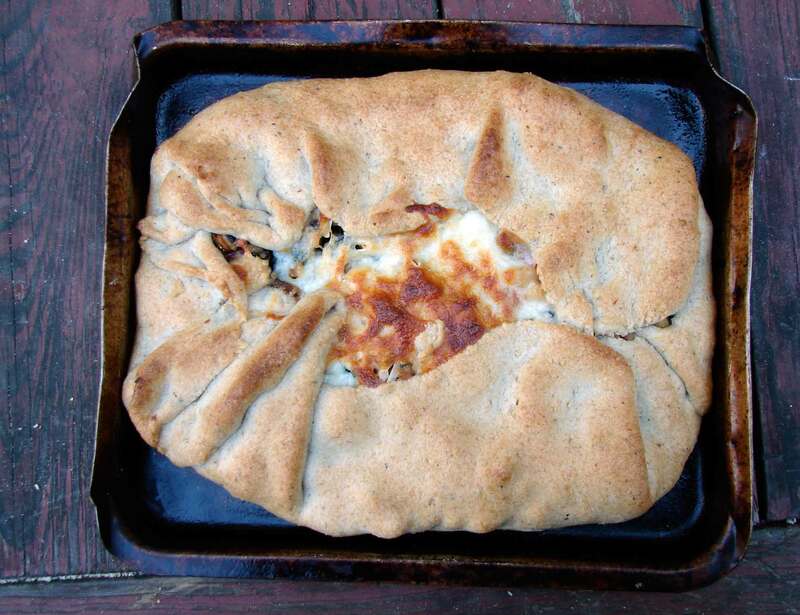 Pile your filling in the middle, top with cheese, and fold over the edges of the dough, leaving a space in the middle. Bake for 20 to 25 minutes until the crust is golden and browned and the cheese is melted. This entry was posted in basic pie filling, beans, crust, mushrooms, pie, recipe and tagged butter beans, galette, roasted beets, walnut crust by Claire. Bookmark the permalink.